Calycanthus (pronounced kal-ee-KAN-thus) is one of the sweetest smelling shrubs you’ll ever have the pleasure of growing. Both its bark and blossoms are exceedingly aromatic, its blossoms described as smelling like a combination of banana, strawberries and pineapple. 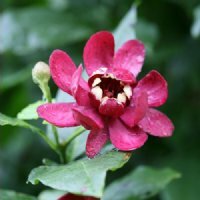 All our Calycanthus Plants for sale are shipped with very well-established root systems. We guarantee them to arrive alive and thriving. Our Aphrodite™ Calycanthus is a Proven Winners® ColorsChoice® selection, but if there was a category for fragrance, she would also win that award. Aphrodite, the Greek goddess of love, beauty and pleasure inspired this Sweetshrub's name. The reason will be quite apparent the first time you see her bloom and partake of her heavenly aroma. Bearing startling magenta-colored, magnolia-like, 3 to 4-inch blossoms, Aphrodite will bloom in the summer and again in early fall.